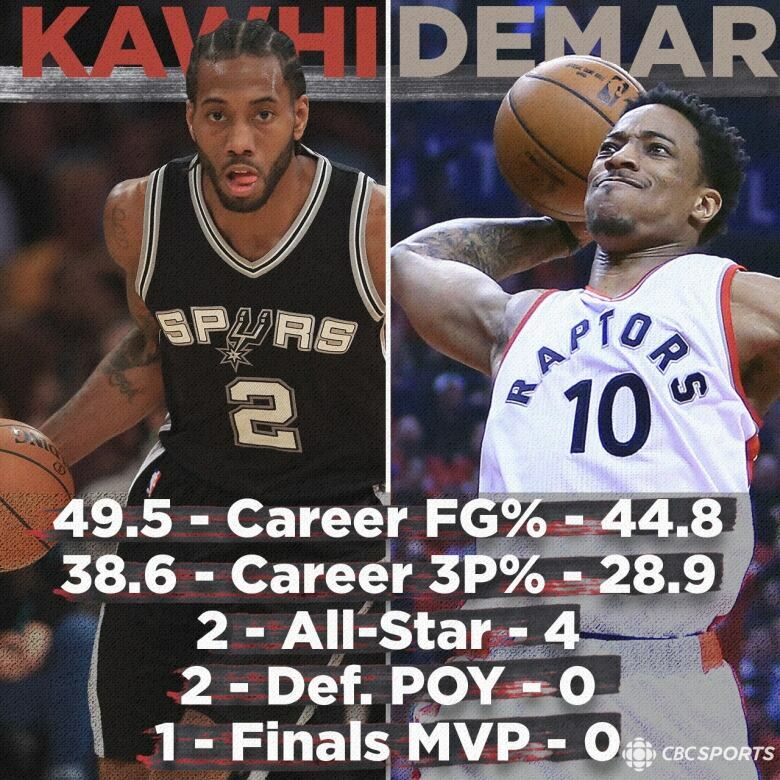 The Toronto Raptors shipped DeMar DeRozan to San Antonio on Wednesday in a blockbuster deal that sees star forward Kawhi Leonard come north of the border. Toronto also gets three-point threat Danny Green in the deal with backup centre Jakob Poeltl and a 2019 protected first-round draft pick going to the Spurs. DeMar DeRozan was unlike many of the franchise players who came before him with the Toronto Raptors. For years, Canada's lone NBA franchise was jilted by stars who eventually either wanted out or declined to put down long-term roots. Not DeRozan, who once famously said "I am Toronto." The city loved him for it, and for the way he helped the Raptors become a perennial contender in the Eastern Conference. But despite nine impressive seasons in Toronto, DeRozan could never get the team over the hump. 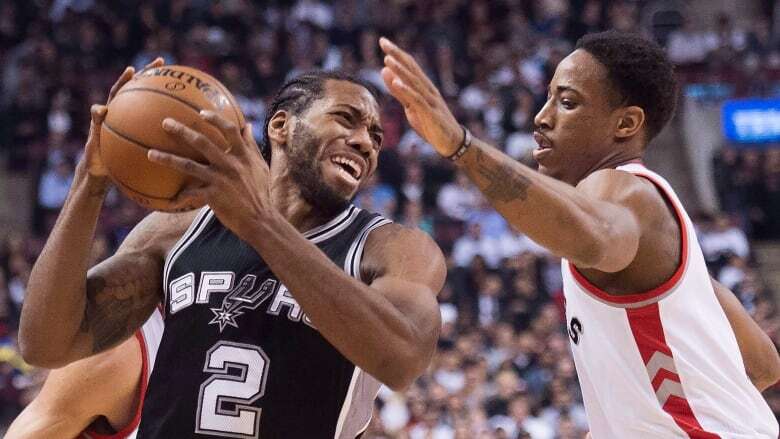 The Raptors shipped DeRozan to San Antonio on Wednesday in a blockbuster deal that sees star forward Kawhi Leonard come north of the border. Toronto also gets three-point threat Danny Green in the deal with backup centre Jakob Poeltl and a 2019 protected first-round draft pick going to the Spurs. Questions remain about the status of a right leg injury that shelved him for all but nine games last season. He was named NBA Finals MVP in 2014 after leading the Spurs to a championship but his relationship with the team deteriorated last season to the point where he asked for a trade. "Kawhi conducted himself wonderfully while he was here," Spurs president and coach Gregg Popovich told local reporters. "He helped us win a fifth championship. As I've said, he was a hard worker all the time. We wish him well but at this point it's time to move on. "I'm concerned about Jakob and DeMar and our basketball team and putting that together. We've got a lot of young kids and it's exciting. But in no way, shape or form does it do any good to go back in time and talk about A, B or C. It's time to move on." Leonard, a two-time NBA defensive player of the year, can become a free agent next summer and has stated that he wants to play for the Los Angeles Lakers. The in-between of an early playoff departure won't be good enough, as Casey learned with his firing last May after a 59-win season. Toronto's top seeding in the East didn't intimidate LeBron James and the Cleveland Cavaliers in the least as they swept the Raptors out of the second round for a second straight year. With James now with the Lakers, the league's powerhouses are in the West. The East appears to be up for grabs with the Raptors, Boston Celtics and Philadelphia 76ers among the early favourites. If he did depart, Toronto would have given up a star in DeRozan — who has three years left on his deal — for a one-and-done player. Toronto would be off the hook on a big-time salary but would likely be forced to significantly retool its roster. DeRozan, a four-time all-star swingman who led the Raptors in scoring in each of the last five seasons, appeared frustrated to be leaving. He posted messages on his Instagram account that suggested he wasn't expecting to be dealt. "Be told one thing & the outcome another. Can't trust em. Ain't no loyalty in this game. Sell you out quick for a little bit of nothing... Soon you'll understand ... Don't disturb," he said. For the upcoming season, new Raptors head coach Nick Nurse will guide a team that looks quite formidable on paper. Barring any other moves, Leonard and Green join a solid core that includes veterans Kyle Lowry, Jonas Valanciunas and Serge Ibaka along with young talents like OG Anunoby, Pascal Siakam, Fred VanVleet and Delon Wright. Leonard, 27, averaged a career-best 25.5 points a game in 2016-17, when he finished third in MVP voting. Green, a 31-year-old shooting guard, started 60 games for the Spurs last season and averaged 8.6 points. DeRozan was selected by Toronto with the ninth overall pick in the 2009 NBA Draft. He led the Raptors to the playoffs over the last five years, including an East final appearance in 2016. "No matter what...When I think of Toronto Raptors Basketball... I think of DeMar DeRozan...He deserves a statue," former teammate DeMarre Carroll posted on Twitter. DeRozan, 28, is the Raptors' all-time leader in points (13,296), field goals made (4,716), free throws made (3,539) and games played (675).